Image Credit: E.O. Scholefield, Governor General the Duke of Connaught and F.M. 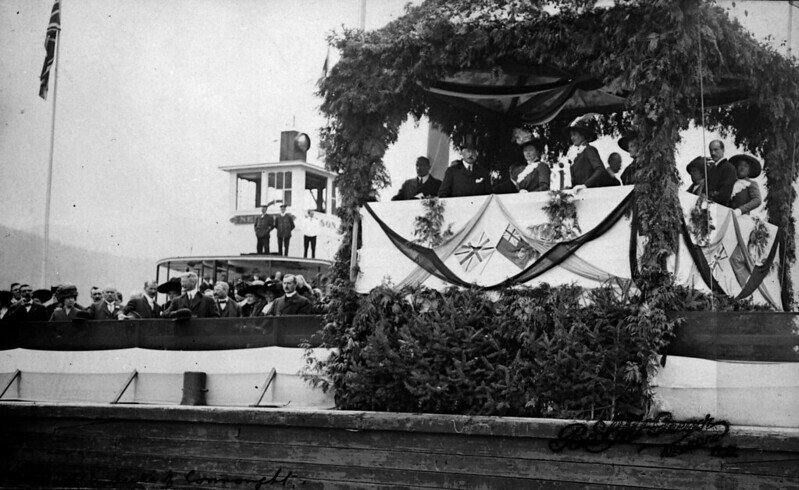 Rattenbury at the laying of the cornerstone for the new provincial library, 29 Sep 1912. BCA H-00478. Dotted across the province are innumerable plaques, cornerstones, trees and statues documenting the official visits of members of the royal family. Some are well-known, such as the large statue of Queen Victoria on the grounds of the Legislature in Victoria. The Prince of Wales, later to become Edward VIII, laid the first stone at the base of the monument to his great-grandmother in 1919 when he visited the BC capital as part of a two-month tour of the country. Provincial Archivist and Librarian Ethelbert O. Scholefield, Governor General the Duke of Connaught, and architect Francis M. Rattenbury laying the cornerstone for the new Legislative Library. In 1912, his great-uncle the Duke of Connaught (pictured above) laid the cornerstone for the new provincial library at the Legislature, with the assistance of the architect Francis Mawson Rattenbury and E.O.S. Scholefield, the Provincial Librarian and Archivist. These occasions were an opportunity for large numbers of the public to view the royals. They were also opportunities for politicians to draw attention to the latest engineering or architectural project sponsored by the provincial government. During her 1958 visit, Princess Margaret was invited to open the new floating bridge in Premier W.A.C. Bennett’s home town, Kelowna. The ceremony involved cutting a ribbon, unveiling two plaques and then finally driving across the bridge. King George VI and Queen Elizabeth, Victoria, 30 May 1939. BCA G-06366.